Eventually, the food movement had to go this far. As soon as a lot of people started buying organic, locally grown farmers'-market fare, food snobs had to do something else to feel superior. They had to look down on the masses' reliance on the whole modernized "growing food on purpose" thing. They had to go back to a more honest, preagricultural method: foraging. That's how searching the woods or parks or even cracks in the pavement for edible plants has become the latest culinary obsession. In June, forageSF's Iso Rabins gathered 70 vendors and 2,000 customers in San Francisco for his once-a-month Underground Market for foraged food. There's a restaurant in Los Angeles called Forage that lets people take in stuff they find (or, for slackers, grow in their gardens) to exchange for credit toward their dinner. Meanwhile, menus across the land are listing wild leeks, fiddlehead ferns, stinging nettles and berries you've never heard of. 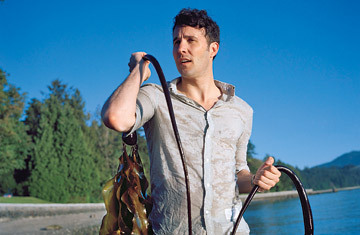 Chris Hastings of the Hot and Hot Fish Club in Birmingham, Ala., often goes foraging and explains its appeal: "You can pursue a bunch of b_______ cooking like sous vide this or sous vide that or foam this or foam that, but to celebrate wild, foraged things and get back to an elemental place is an intellectually much more interesting place for me as a chef." In early summer his customers can order a completely foraged dessert. "It freaks them out," he says. "The flavors are intense. They're unique. They're not like a cultivated strawberry." The publishing industry is catching on to the trend, with two foraging cookbooks coming out this fall. One is by Rene Redzepi, the head chef at Copenhagen's Noma  which was just named the best restaurant in the world in the annual S.Pellegrino poll  and includes a recipe for pulp of air-dried sea buckthorn with pickled rose hips. The other book comes from forager Connie Green, who sells to the French Laundry and other fancy restaurants in Northern California. "It's not a new world," she says of foraging. "Anyone who has spent any time on the coast in France knows what sea beans are." Kerry Clasby, another California forager, recently started letting consumers buy from her truck one day a week in Las Vegas. Otherwise, she caters strictly to high-end restaurants. "Tom Colicchio and Mario Batali will both get in the truck and root around," she says. Tyler Gray of Oregon-based Mikuni Wild Harvest sometimes rides the New York City subway with $50,000 worth of foraged truffles in his backpack. "It's such a crazy subculture," he says of food finders, who speak in "traveling-gypsy code," as he puts it. "You don't want anyone to know where you're foraging," says Gray, whose truck has been shot at while he was out searching for food. Ava Chin, who blogs about urban foraging for the New York Times, won't say where in the city she once found nearly 100 morels. She recently tapped a maple tree near her Brooklyn apartment, which upset her neighbors. "In New York, everyone freaks out and figures you must be hurting the tree," she says. "I don't know where they think maple syrup comes from."